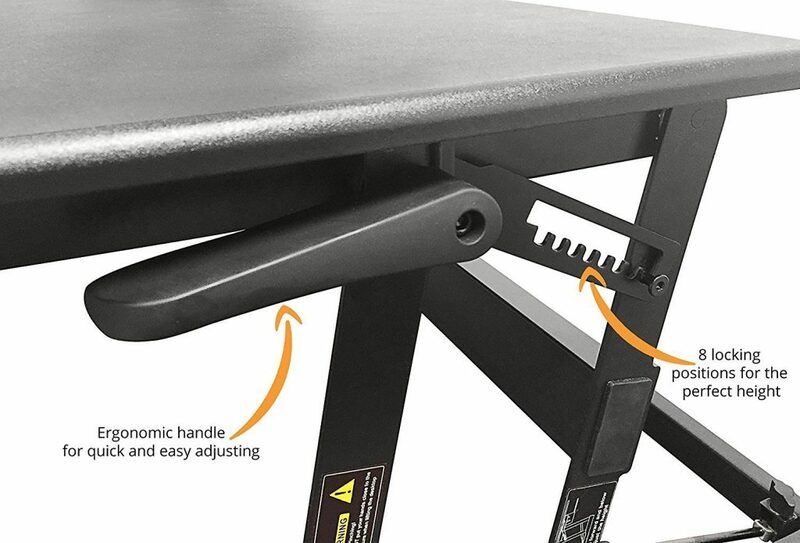 Gas spring arm allows easy movement and adjustability between multiple locking positions, even with 35 lbs of weight loaded. The DeskDoc comes with an anti-fatigue mat. 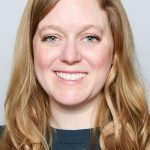 The increasing knowledge about the dangers of prolonged sitting or a sedentary lifestyle, as well as the benefits of standing in the workplace results in companies and health-conscious individuals buying standing desks and other ergonomically friendly furniture. DeskDoc is one of the leading companies that provide ergonomic standing desks and accessories. 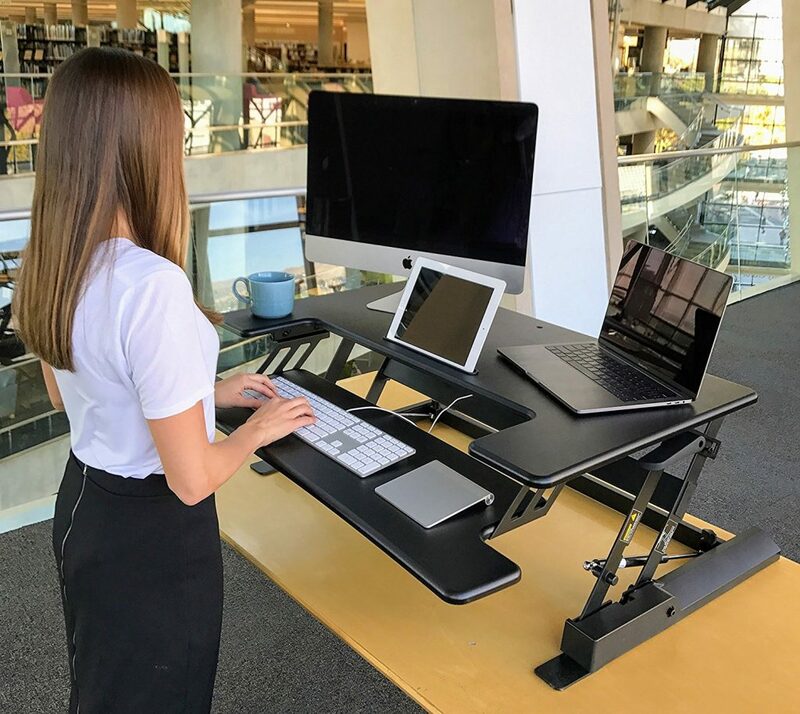 The Premium Standing Desk is one of their bestsellers competing against other top-of-the-line best standing desk converter brands like VARIDESK, VIVO, and etc. All these brands claim to be the best in changing how we work by choosing a healthier approach. But how does DeskDoc’s Premium Standing Desk differ from its rivals? What are its advantages and disadvantages? Is it worth it? Let us find out. 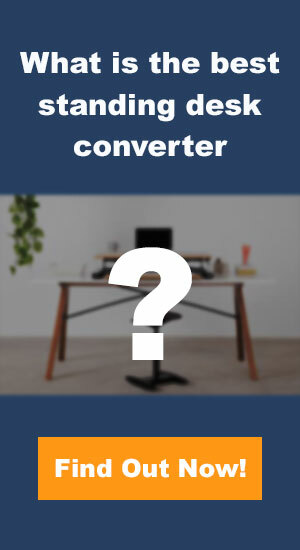 Review summary This is a larger standing desk converter, enough to add a 27″ monitor and a laptop (might even be able to squeeze a dual 27″ monitor in there). This is a two-tier desk setup, where the keyboard 11 inches deeper than the surface of the desk. Unlike most of the stand up desks on the market, this has a 10″ tablet and/or mobile slot. This desk uses gas piston with a lever for easy desk raising. Warranty 90 days of no questions asked and will be fully refunded if there is any malfunctions of any kind. 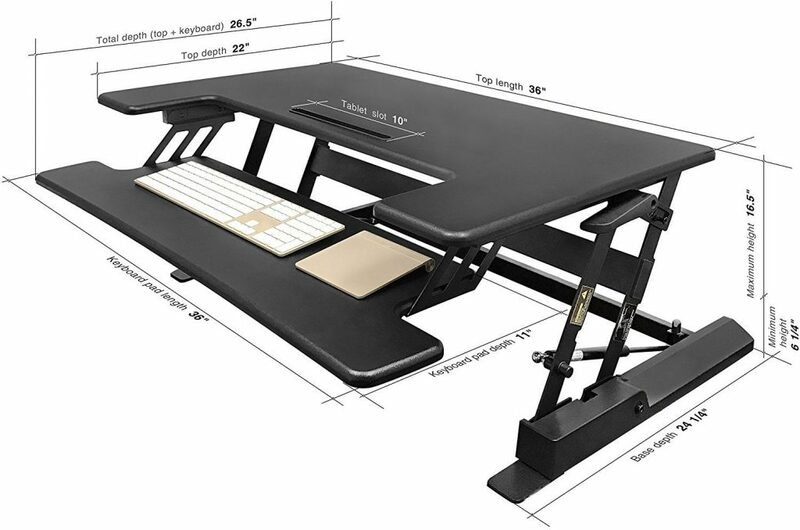 Unlike any other desks, this DeskDoc comes with a anti-fatigue mat, so you don’t have to go searching for one. In addition, this mat comes preassembled, making it convenient for you to go from a sit to standing up lifestyle. This wellness mat can only do so much for you. We recommend taking a look at our list of reviewed non-flat anti fatigue mats. DeskDoc’s Premium Standing desk has an extensive 36 inches work surface that can accommodate two-large monitors and other desktop items including an extra slot for your smart devices. The spacious keyboard tray can fit a standard, full-sized keyboard and a mouse at the same level. If you love to multitask or if you are a little bit of an obsessive-compulsive, you would enjoy this desk! It has a huge work surface that allows a dual-monitor setup, even if you have two large monitors. 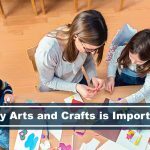 You will have more room for other desktop items and your paperwork. There is even a slot dedicated to your handheld device like a smartphone or tablet if you need it within your arm’s reach. Your standard, full-size keyboard and mouse can fit the spacious keyboard tray that is at the same level as the workspace and is 11 inches deep. The gas spring mechanism allows for an effortless transition from sitting to standing position, and an easy height adjustment movement. Overall, this desk is easy to navigate. You just have to squeeze the arm if you need to raise or lower the desk when you switch from sitting to standing position and vice versa. This desk is made to last. The built and finish of the desk is without question, high quality. It is extremely sturdy even at the maximum height setting. You do not have to worry about the desk crashing when it is loaded with your desktop items and even when you put pressure on it. Also, the desktop has a nice finish and works well with a mouse. You do not need to use a mousepad. The desk comes in two colors: black and white. You can choose the one that best fit your workstation’s interior. The desk can hold up to 35 lbs of weight and remains sturdy even at its extended height. However, given the weight capacity, built, and size of this desk, you can only expect that the whole desk would be massive. It would be a struggle to carry the desk from one location to another. So if you change location very often, ask for help or risk damaging your back. You’ll be able to use an iMac with your laptop, and the added tablet insert is great too if you need an additional screen. The image shows the stand up desk converter at full capacity to give you a good ida of how big the table top is. Multiple height adjustment settings work great, but probably not for people over 6 feet tall. Some users find it too low that it defeats its ergonomic purpose. You might want to check first if the height level suits you before you buy this desk. The Deskdoc provides eight different height levels and uses a locking mechanism in conjunction with the ergonomic handle for quick and easy adjusting between sitting and standing. Surprisingly, this desk is of extreme quality for a price that is almost half of its rivals. Add an anti-fatigue mat to that, and it’s a steal! So go and hit that add to cart button. You will get an anti-fatigue mat when you purchase this desk. This is a plus! Most standing desks do not offer this, and you will have to buy an anti-fatigue mat separately if you want added comfort when you stand. This premium desk is sturdy, stable, and fully functional for a very reasonable price. This could even be better than more popular choice such as VARIDESK Pro Plus. So yes, we totally recommend this! 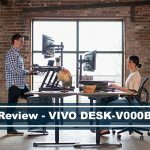 You may also want to check out our list of Varidesk alternatives under $200 reviews. It is easy to manipulate and adjust from sitting to standing in a matter of seconds. This high-quality desk remains sturdy even at extended height. Free anti-fatigue mat with every purchase. Needs minimal assembly. This is not too big of a deal but most people prefer the convenience of ready to use desks. The desk is bulky and heavy. You might hurt your back or pull a muscle if you try to carry this desk around. Some users who are over 6 feet tall are not happy about the extended height of this desk. It is lower than what is expected, which makes it uncomfortable. We recently purchased a DeskDoc and from standing on the anti fatigue mat with high heel shoes put permanent marks almost holes in the mat. Although, the anti-fatigue mat it comes with is great for standard use, however, it isn’t the best when it comes to durability. If you’re constantly wearing heels, we do recommend getting the TOPO anti fatigue mat, as it a lot more sturdy. In addition, the TOPO anti-fatigue mat gives you flexibility of moving your feet around as it is a not flat like the current one you have. You can find our review of our best non-flat anti-fatigue mats here: https://www.deskadvisor.org/best-anti-fatigue-mats-for-standing-desks/. I purchased a deskdoc standing desk. When it arrived the keyboard tray was broken and the pieces that you are to use to secure the element to your desk was missing. There is no customer service to call, who can I reach out to? Did you buy it through Amazon? If so, they will be very happy to help get it all taken care of for you, no hassle!